Flax has become the modern ‘miracle food' because of its high Alpha Linolenic Acid (ALA) and fiber content. Alpha linolenic acid (ALA) is a type of plant-derived omega 3 fatty acid. Benefits of flax seed as shown in many studies include lowering total cholesterol and LDL cholesterol (the bad cholesterol) levels. Other benefits show that flax seed may also help lower blood triglyceride and blood pressure. It may also keep platelets from becoming sticky therefore reducing the risk of a heart attack. Flax seeds have to be ground for nutrients to be better absorbed. Pumpkin seeds are one of nature's almost perfect foods. This mildly nutty seed is a good source of protein and phytosterols, which can help lower blood cholesterol levels. They contain most of the B vitamins, along with C, D, E, and K. They also have the minerals calcium, potassium, niacin, and phosphorous. Pumpkin seeds have mainly been used to treat prostate and bladder problems but they have also been known to help with depression and learning disabilities. Toast or roast pumpkin seeds in your oven. They can be salted or spiced to suit your palate. The shells are edible and are a good source of fiber. Sesame seeds are commonly found on top of buns, add a nutty taste to the dishes, made into sesame snaps (chikkis), or used to make the fragrant sesame oil, but rarely eaten as a snack. These tiny white seeds are surprisingly big in nutrition. Not only are they an excellent source of plant-based calcium and a good source of fiber, they are also rich in lignin and the richest source of phytosterols of all nuts and seeds eaten. These seeds have been shown to have a cholesterol-lowering effect and to prevent high blood pressure and increase vitamin E supplies. They are also very good sources of manganese, copper, magnesium, iron, phosphorus, vitamin B1 and zinc. A handful of sunflower seeds will take care of your hunger, while also enhancing your health by supplying significant amounts of vitamin E, magnesium and selenium. There are many health benefits of these seeds. Sunflower seeds are an exceptionally good source of Vitamin E, which helps to protect the brain from oxidative damage and may protect against cardiovascular disease. They are also high in magnesium, a mineral that has been shown to be helpful in the prevention of migraine headaches. They contains lignans, that might protect against some cancers and choline, that has been shown to play a role in memory and cognitive functions. Sunflower seeds are also phytosterol-rich and can be part of a cholesterol-lowering diet. Sunflower seeds can be used to enrich any meal. They can be sprinkled over cereals, salads, soups, mixed with vegetables, used on desserts or as snacks. 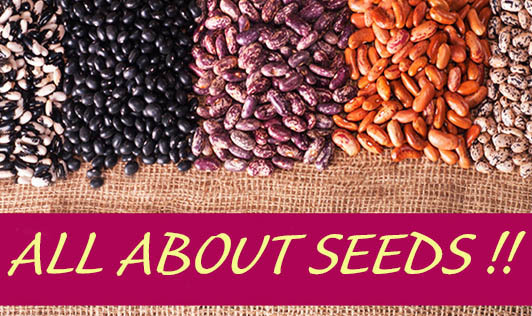 Seeds are highly nutrient-dense and are very versatile. Include more seeds to up your nutrition by snacking on them, or adding them to, raita or salads, breakfast cereals, and breads - the possibilities are endless!